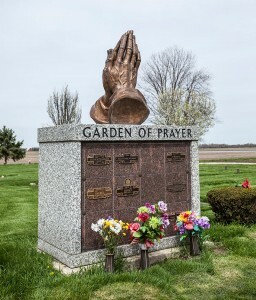 Hundreds of people visit the cemetery each year. Because the cemetery is open to the public, it is very difficult to control the activity of every visitor.We regret that we cannot guarantee decorations from damage or disappearance. Please remember that all decoration regulations exist more to protect the conscientious lot holder than to hinder him. If there were no regulations, both the cemetery and the lot holder would find good efforts useless. While we all cannot agree completely on decoration rules, the cemetery has tried to establish the fairest set of rules for all. Artificial decorations and fresh flowers are permitted during the growing season. Decorations must be placed in permanent ground level vases. If decorations are placed in temporary vases, both the decoration and vase will be removed when that section is mowed. If a ground level vase has not yet been placed at interment location, approved designs are on display at the Green Lawn Cemetery office. All forms of decoration not specifically approved will be removed. This includes jars, bottles, Styrofoam, crockery, statuary, cans, vigil lights, ornaments, potted plants, hanging baskets and similar items. Decorations that become unsightly or withered are removed weekly on a regular schedule for the best appearance of your lot and cemetery. Someone must make this decision, and we hope you will appreciate that we make it as carefully as we can. We have no desire to displease you are we leave the decorations on as long as appearance is presentable. All plantings are strictly prohibited and will be removed. This includes unauthorized trees, bushes, and evergreens. Flags may be placed only on Memorial Day, Independence Day, and Veterans Day. They may be placed three days prior to the holiday and will be allowed to remain throughout the next week. Artificial wreaths less than 30″ in diameter, set on stands or easels are permitted. Artificial flowers in approved temporary vases, pots, and boxes are permitted. Natural evergreen grave blankets are permitted from November 20 to March 1. The period from March 1 to April 1 in traditionally used by the cemetery to clean up the grounds and prepare the cemetery for Spring. All Fall and Winter decorations are removed as soon after March 1 as weather permits. If you wish to save your decoration, please remove it before March 1st.